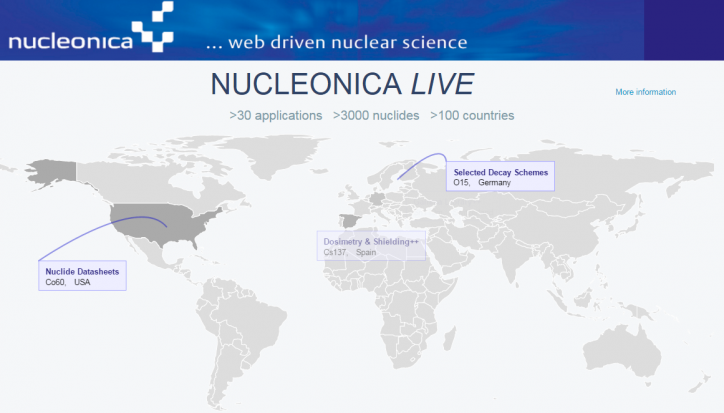 Nucleonica Live monitors and displays activity worldwide on the Nucleonica servers. When an application is launched by a user on the Nucleonica servers, the data are logged and superimposed on a world map. In addition to showing the name of the application, the nuclide selected and the country from which the application is launched are shown. Currently over 30 applications and over 300 nuclides are available in over 100 countries. 5 years ago, we set out on a mission to build the most innovative technical resource for knowledge creation and competence preservation for the worldwide nuclear science community. Our vision was to not only to provide scientists, engineers and technical personnel in the field with the best software solutions available, but also to create a sustainable home for the nuclear science community on the web. – We have established the leading nuclear science portal with thousands of users worldwide from universities, government research organizations and private companies and thereby created a truly global community. – We developed over 40 state of the art nuclear science software solutions, which have delivered almost 4 million calculations over the past five years. – Since we started back in 2011, all Nucleonica applications have undergone major upgrades with a view to improving user-friendliness and calculation response times. – In 2015, we have also released the new 9th print Edition of the Karlsruhe Nuclide Chart, containing 147 new nuclides and 1497 nuclide updates compared to the 2012 edition. 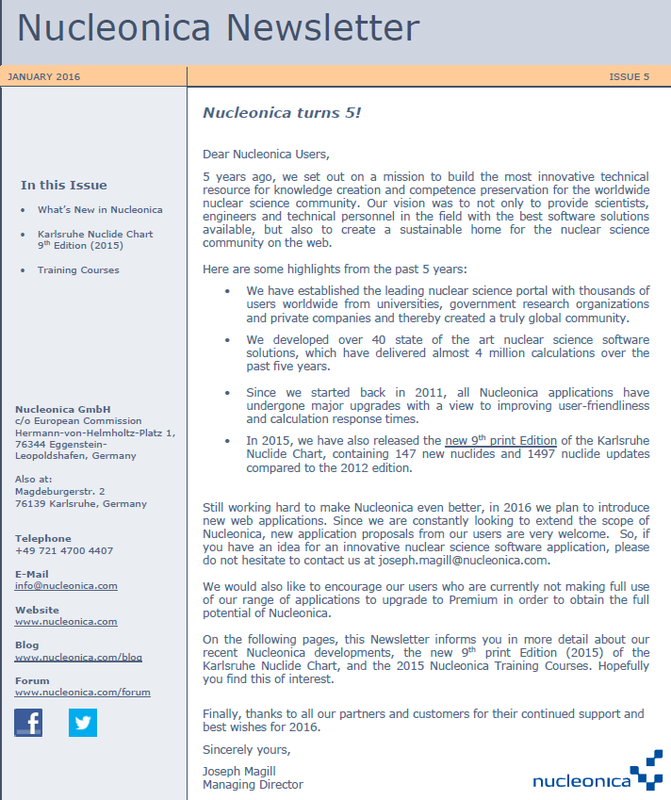 Still working hard to make Nucleonica even better, in 2016 we plan to introduce new web applications. Since we are constantly looking to extend the scope of Nucleonica, new application proposals from our users are very welcome. So, if you have an idea for an innovative nuclear science software application, please do not hesitate to contact us at joseph.magill@nucleonica.com. We would also like to encourage our users who are currently not making full use of our range of applications to upgrade to Premium in order to obtain the full potential of Nucleonica. 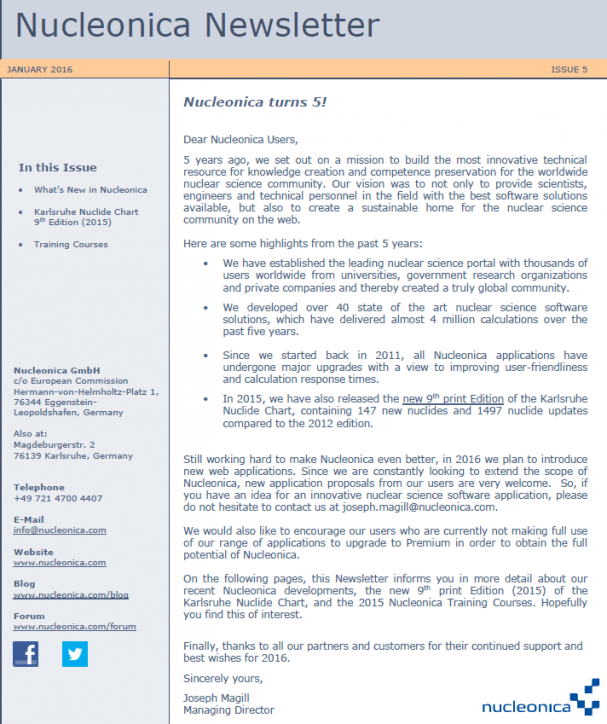 On the following pages, this Newsletter informs you in more detail about our recent Nucleonica developments, the new 9th print Edition (2015) of the Karlsruhe Nuclide Chart, and the 2015 Nucleonica Training Courses. Hopefully you find this of interest. Finally, thanks to all our partners and customers for their continued support and best wishes for 2016. 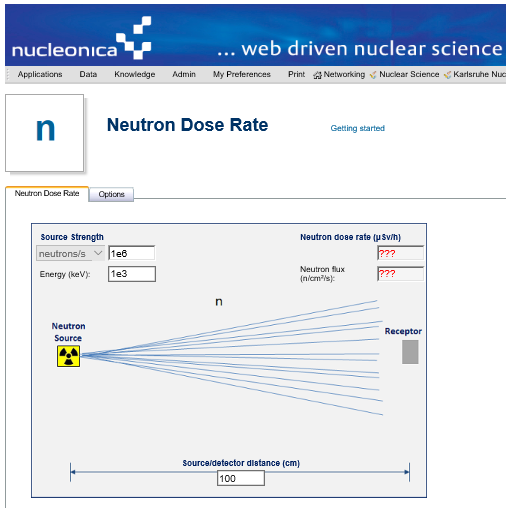 The new Neutron Dose Rate application in Nucleonica allows the user to calculate the dose rate for mono-energetic neutrons based on the Fluence Per Unit Dose Equivalent conversion factors from NRC regulations. – The input source strength can be specified in neutrons/s or neutron flux cm-2 s-1 together with the energy of the mono-energetic neutrons and the distance from the source to detector. The output is given in mSv/h or mrem/h. – The present version of the application does not allow for shielding. This will be introduced at a later stage based on the use of neutron removal coefficients. – A new mode of operation has been introduced. In addition to the existing Gamma dose rate, Shield thickness, and Source strength modes a fourth “distance” mode is now available. This allows the user to calculate the distance between a source and the detector providing the source strength, shield and shield thickness, and the gamma dose rate are known. 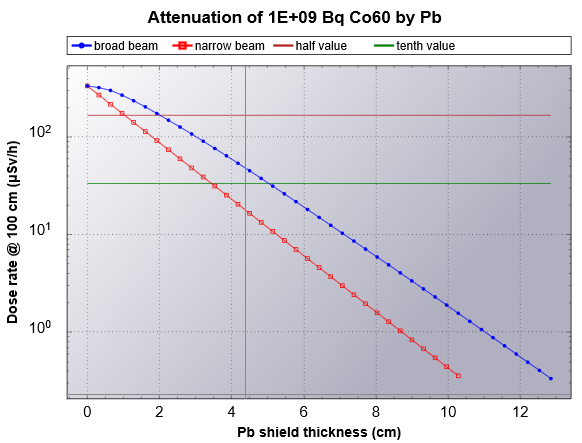 – The Dose Rate/Thickness graph has been extended to include the half and tenth values of the shield material. The graph also show the results for narrow beam and broad beam (including the B-factor) geometries. 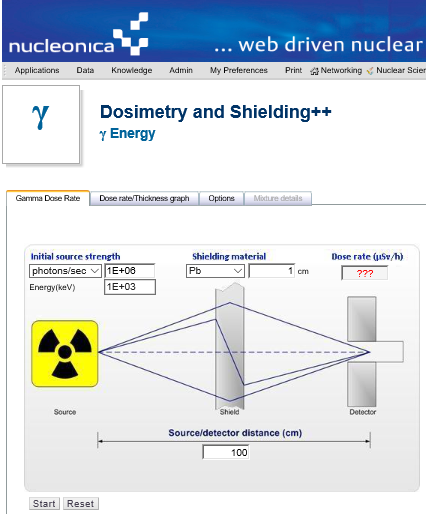 – It is now possible to make dosimetry and shielding calculations for a single photon energy and photon emission rate (rather than selecting a radionuclide). In the drop-down menu for the source strength, in addition to selecting the activity, mass, or numbers of atoms, the user can select the photon emission rate, photons/s, and the photon energy. – The gamma and X-ray line spectrum has been extended to shown the photon intensity (photons per second) versus energy emitted from the source. Previously only the emission probability vs. energy was shown.